A Deluxe, Spa Quality Foot Washer and Massager. 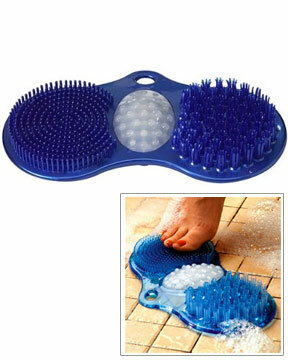 One of the easiest and most convenient ways to clean and pamper your feet at the same time. No more bending over, slipping, falling or straining. This simple little device allows you to get your feet super clean in a hurry, and it also provides a stimulating massage as you wash. The whole thing adheres to your shower floor with suction cups, so you can clean, massage and exfoliate without any awkward balancing or bending over. The unique, 3 in 1 footpad features 2 bristle textures and a center piece. The left side has a rougher texture to massage and increase blood flow as you wash. The other side features a grass-like surface that deep cleans your feet on all sides with a simple back and forth motion. The Soapy Soles Elite come equipped with a massaging insert at the center, but it can be switched for a pumice insert, or a soap dispensing insert as well. While you're waiting for your hair conditioner to soak in, knead your heels and arches across the rubber mound to relax you whole body. Swap it out for the pumice insert to remove calluses and gently exfoliate your feet to eliminate dead skin. You can also pop in the soap dispenser insert, and one quick motion will release the perfect amount of body wash right onto your foot. Whether you have trouble reaching, really dirty feet or just the desire to pamper yourself on a daily basis, this product is the perfect tool to get the job done. It is a home treatment system that turns your shower into a deluxe foot spa. It will scrub, massage, and exfoliate your feet with three different surfaces. Proven to prevent falling in the shower, it is great for the elderly, people with disabilities, children, and folks with arthritis, but it is also ideal for anyone else that wants to wash their feet the easy way. The material feels great underneath you toes, and it is ideal for gentle scrubbing and building a thick lather. With multiple surface types you have more ability to stimulate and scrub, and with changeable inserts it can become even more versatile. Deep stimulation will ease tension in the heel and ball of your foot, and regular use will keep your feet healthy. Hundreds of little fingers will massage your feet as you deep clean, and remove every spec of and dirt. Your skin will be left incredibly clean and invigorated in very little time, and without any bending or struggling. To use, just attach to the floor of your tub by pressing firmly. The strong suction cups will take hold and glue it in place. Allow it to get wet, and wet your foot as well. Apply a small amount of liquid soap, shampoo or body wash, or use the soap dispenser insert to roll some onto your skin. Rub your foot back and forth for a thorough, soothing foot wash. A thick lather will build up quickly to thoroughly cleanse your feet with ease. Allow to rinse when finished. Leave to dry and remain for later use. The American Podiatric Medical Association recommends washing feet regularly, especially between the toes, to keep feet healthy. But for those with circulatory disorders or who have trouble bending over, keeping feet clean can be a real challenge. The Soapy Soles Elite is perfect for these people. For the rest of us, it can save time and allow us to benefit from the therapeutic massage and the resulting, super clean feet. This hands-free foot scrubber has been designed to gently wash and stimulate your feet without you having to use your hands or strain in any way. It is great for camp or beach showers too because it makes it easy to clean really dirty feet, and will quickly remove sand, mud, caked on dirt and more. Stop hopping on one foot to wash the other. Clean and pamper your feet the easy way with this great product. Get Yours Today! Dimensions (l x w x h) 11.5" x 5.5" x 1.5"
One of the best ways to wash your feet. Get a spa quality foot treatment right in your own shower. This elite model is a three in one tool that cleans, massages and stimulates your feet. Great for elderly, people with arthritis, folks with disabilities, children, those with really dirty feet and more. Order Today! I bought this item due to recently having major lower back surgery. I thought that not having to bend down to clean my feet was the best. The foot massager and the foot cleanser works great, but I also bought a pumice stone to replace the center item. It didn't last but a day or two before it broke off. Besides the pumice stone, I love using the soapy soles elite. Not only does it clean every nook and cranny, but it gives you just the right amount of a foot massage to go throughout the day with little to no foot pain. And using this on a regular basis, I can say that my feet feel more energized and have little to no pain at the end of the day. A Multi-Use Tool For Mopping, Scrubbing, Squeegeeing & More. Disposable Shower Drain Cover. 100% Biodegradable. A Scrubbing and Exfoliating Tool For The Bathtub or Shower.